Talking too much to the cows? Social Media Training can help you talk directly with your customers. 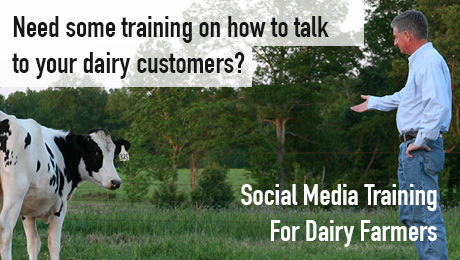 Want to learn how to use Facebook or Twitter to better communicate with your dairy customers? Or maybe how to use LinkedIn to connect with other businessman. These courses provide the “How To’s” as well as tips and tricks to help promote and protect your farm. If you have any questions about the trainings provided below, feel free to contact me at don.schindler (at) rosedmi.com or gmail.com. You can also find me on Facebook, LinkedIn, or Twitter. Branding 101 – How do you create and build a personal brand? Evernote 101 – Why can’t I use paper for notes anymore? Facebook 201 – What should you be posting on your Facebook Farm Page? Facebook 201 – How Do Set Up Your Facebook Page for Your Family Farm? Google Analytics 101 – How Should You Set Up Your Google Analytics Dashboard for Your Farm Website? Google Analytics 101 – How Do You Set Up a Goal in Google Analytics? Instagram 101 – Why should you use Instagram for your farm or business? Negative Comments 101 – Are negative comments really negative? Sure they are but you can change them. Pinterest 101 – How Do You Use Pinterest? Pinterest 101 – What are the best tips on using Pinterest for your farm or business? Web Metrics 101 – Which social media marketing metrics should I be measuring? Web Writing 101 – How Do You Write for the Web? Web Writing 101 – Why aren’t you using these top six simple headline techniques? YouTube 101 – What Can YouTube Do For Your Farm or Business? YouTube 101 – How do you set up a YouTube Channel for your farm or business? I’ll be adding more classes as I go along. If you have a request or question, don’t hesitate to contact me.